As a young boy growing up in Ghana, Kofi Gunu witnessed war’s images, heartbreak, and destruction. It is from these personal experiences that Kofi was motivated to educate and inform people in a global context about such elusive concepts as peace, conflict, and identity. 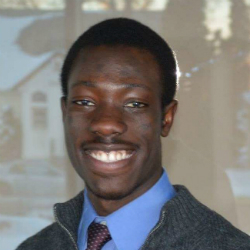 Kofi traveled to South Dakota through a youth exchange program that was created by the U.S. government in hopes that cross-cultural interactions would reduce racial and cultural misconceptions. He continued his studies in South Dakota, attending Augustana University in Sioux Falls, where he continued his work to create a harmonious global society. Kofi received a Nobel Peace Prize Forum scholarship to attend a 7-week course in Norway investigating advanced conflict resolution. He used this experience to create the Augustana Peace Club, which fosters conversations about emerging and critical challenges in the world. The group’s “Freeze for Syria” campaign helped break through the Islamophobia and anti-immigrant sentiments to share the stories of Augustana students who were refugees or of Middle Eastern descent. The project’s success led to Lutheran Social Services requesting the Peace Club’s assistance in a campaign to enhance the efficiency of its refugee resettlement and workforce development efforts in the Sioux Falls area. The Hawkinson Foundation scholarship will enable Kofi to work as a Franklin Williams intern at the Council on Foreign Relations in Washington, D.C. This highly competitive internship will allow Kofi to explore how relationships between China and other countries are impacting stability and peace. Kofi plans to pursue his master’s degree in international studies as a Schwarzman Scholar at Tsinghua University in Beijing.